BSN Medical 2089000 Elastomull GauzeStretch Roll is a gauze-style bandage that is non-adhesive, flexible and offers a precise fit over the wound as needed. The flexibility shows best when placed in an area such as the knee or elbow, as it's able to conform to moving parts without binding or bunching, causing an unneccessary change. This gauze-style bandage allows for maximum lift of exudate with a very low risk of infection due to particle contamination. 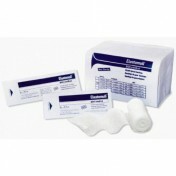 The gauze bandage is able to perform well with edemas and to control bleeding wounds as well. 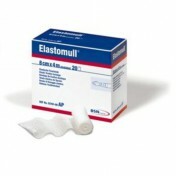 Elastomull GauzeStretch comes in a two-inch width and measures beyond 12 feet in length. The bandage is flexible enough to use either as a multiple-layered covering or can be cut to pieces for a better fit.